To teach diaspora youth to serve and rebuild their homelands with local churches. About 7 million Koreans live abroad in 180 countries, with 5,500 Korean churches often at the center of immigrant life. These statistics of the Korean diaspora suggest that Korean diaspora churches have been given a wonderful opportunity to spread the good news about Jesus among the nations. Therefore, the Ezemiah Foundation calls on 2nd and 3rd generation Korean Christians to direct the strength of the Korean diaspora toward spreading the Gospel beyond national borders and ethnic groups rather than staying complacent within our “Korean bubbles.” Our vision is to prepare the diaspora youth – from immigrant church Korean-Americans to missionary kids in the Middle East, Asia, Africa, and Europe – to become 1) community servant-leaders abroad like Daniel and Esther, who led lives that proclaimed the kingdom of God in diaspora communities and in their new home countries, and 2) God’s servants in Korea like Ezra and Nehemiah, who rebuilt communities socially, politically, and spiritually in their parents’ homelands. 1) to serve rural churches and schools as they meet the English educational needs of children from broken families sent to live with their grandparents in the countryside as well as those from multicultural families, including those born in Korea to biracial couples and those who migrated to Korea from southeast Asia in order to start new lives with their mothers and Korean stepfathers. 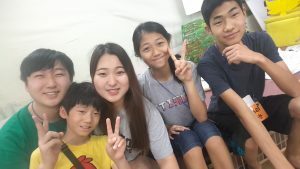 As many Korean diaspora youth understand the difficulties of being a third-culture-kid, we hope that we can share in the identity struggles of these children being raised in Korean rural areas. 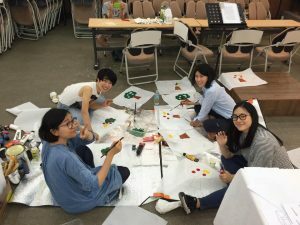 In this process of serving rural churches and the next generation of Koreans with the hope of a North-South reconciliation, we pray that diaspora youth themselves may also grow in their love of and capacity to serve communities in their immigrant homelands – in the US, Canada, Sweden, Colombia, Kenya, and all over the world – thereby producing “Daniels and Esthers” serving abroad as well as “Ezras and Nehemiahs” serving in Korea. 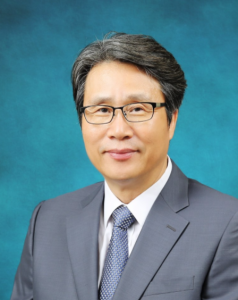 약 7 백만의 한인들이 180 개국에 해외에 살고 있으며 5,500 개의 한인 교회가 해외 이민생활의 중심에 있습니다. 이를 통해 주님께선 세계로 흩어진 한인 디아스포라 교회에게 복음을 각국에 전파할수 있는 기회를주셨습니다. 따라서 저희 에즈마이야 파운데이션은 제 2 세대와 제 3 세대 한인 크리스챤들이 우리 한인들만의 공동체만 바라보는 것이 아니라 않고 지역과 인종을 넘어서 세계를 바라보며 성장하기를 바랍니다. 우리의 비젼은 디아스포라 청년들, 즉 한인 교회 2세들과 선교사 자녀들이 (1) 다니엘과 에스더와 같이 해외 지역 사회에서 지도자가 되어 타국에서도 하나님의 복음을 전파하고 (2) , 에스라와 느헤미야와 같이 조국의 사회적, 정치적, 영적 재건을 위해 헌신하기를 바랍니다. 1) 다문화 가정. 시골에서 조부모와 함께 살고 있는 어린이들과 다문화 가정 자녀들의 교육을 담당한 농어촌 교회와 학교들을 영어 프로그램으로 섬기는 것. 많은 한인 디아스포라 청년들이 제 3의 문화 아이들 (Third-Culture Kid)의 어려움을 공감하므로 이들이 조국의 농어촌 지역에서 자라 나고 있는 다문화 가정 아이들의 건강한 정체성 형성을 돕기를 희망합니다. 2) 북한. 다음 세대 청년들이 문화권과 인종을 넘어 함께 섬김으로서 남북한이 재결합되는 시대를 준비하며, 특히 조국의 청년들과 한인 디아스포라 2세들이 미래의 북한 교회와 학교를 재건하기 위해 함께 동역할 수 있도록 준비를 하는 것. 통일이 정치적 현실이 될지 확실하지는 않지만, 우리는 글로벌 한인 디아스포라 젊은이들이 “아메리칸 드림”과 번영 복음을 쫓기 보단 하나님의 말씀 속에서 자신들의 역사적 사명을 인식하며 그 날을 위해 준비를 할 수 있도록 지금 투자합니다. 농어촌 교회를 섬기며 차세대 남북한 통일을 준비하는 이 “에스라, 느헤미야” 과정을 통해 우리는 디아스포라 청년들이 해외 지역 사회에서 더욱더 건강한 정체성과 분명한 사명을 가지고 섬길 수 있는 “다니엘”과 “에스더”가 되기를 기도합니다. In 2006, I received God’s calling to launch the Ezemiah Movement. along with the dreams of the future generation Koreans in rural areas. Since then, I have hoped to join these two groups in friendship and bind them together with the Gospel, preparing them as future leaders in its mission. The Lord has brought together faithful servants from all over the world to join us in the movement. I believe the work we put in today for these children will bear fruit as they grow up to follow in the footsteps of leaders like Daniel, Esther, Ezra, and Nehemiah for the global Kingdom of God. I also believe that they, together with the future generation of North Korea, will work to rebuild North Korean churches and society. Today, Ezemiahs of another kind are growing in Korea. They are the children of multicultural families, many of whose mothers come from southeast Asia. Along with children born to Korean fathers and first-generation immigrant mothers, there are about 15,000 youth who have left their original homeland to come live with their mothers and Korean stepfathers in Korea. Although these youth are sometimes portrayed as potential “troubled youth” in the Korean media, we believe that these biracial and multicultural children have the potential to contribute to the building up of both Korea and the homelands of their mothers. Our dream is to see these children grow up into leaders who will bridge Korea and their native countries for the prosperity of both these nations and for the sake of the Gospel. As the Ezemiah Movement met its tenth year, there was a small but significant change: change in the content that we teach at the Vacation Bible Schools. For the first ten years, Ezemiah used the VBS material published in the States and used by many American churches. However, we found that this content was not necessarily a good fit for our Korean audience and that and the message was increasingly simplistic and repetitive. Therefore we tried out making our own VBS from scratch on our tenth anniversary, and we have been trying again every year since! We found that we not only were capable of creating and using our own content grounded firmly in the Bible and more geared to our ESL audience, but that a new generation of young leaders in South Korea and the United States was stepping up who enjoyed making this material! We have also found that in partnership with 생터 사역원 Life Place Bible Ministries, this material is in high demand among Korean churches in Seoul as well – and have now translated the material into Korean as well! 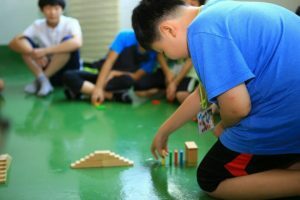 We pray that this process of making and teaching our own VBS programs will not only bless children in Korean rural churches but also children and youth across the 6,000 Korean churches in 180 countries. We are hopeful and prayerful as we see that the Ezemiah Movement is moving beyond borders – to the Philippines, Myanmar, England, and Jordan – through small pockets of youth and Sunday School teachers who are interested in using this material. We are seeing that missionary kids and their families in these areas have also responded to this call to use their unique third-culture background to serve the lands that they grew up in. Therefore I personally have great hope that God will be using the Ezemiah Movement to efficiently facilitate the next generation of people called to spread the Gospel. I invite you to join us! We are praying and waiting for the next generation of youth in the global Korean Diaspora church to respond to God’s holy call on their lives – beyond borders, beyond race! 2006년 주님의 부르심을 듣고 에즈마이야 사역을 하게 되었습니다. 미국에서 한인이민교회를 섬기면서 자라나는 2세들의 무한한 가능성을 보았고, 또 한국의 농어촌에서 자라나는 다음 세대들의 꿈을 함께 보았습니다. 복음과 말씀으로 이 둘을 묶어 서로 우정을 나누며 다음 세대의 지도자들로 키우고 싶었습니다. 주님께서는 에즈마이야 사역에 전 세계의 충성스럽고 신실한 하나님의 사람들을 동원하여 이 일을 하게 하셨습니다. 언젠가 우리가 이 양쪽의 젊은이들에게 쏟아 부은 땀을 다니엘, 에스더, 에스라, 느헤미야 같은 세계적인 주님의 왕국의 지도자들을 세우는데 밑거름으로 쓰실 줄 믿습니다. 그리고 또 언젠가 그들이 북한의 다음세대들과 함께 북한의 교회와 사회를 재건할 줄로 믿습니다. 오늘, 이 땅에 또 다른 에즈마이야들이 자라고 있습니다. 그들은 동남아에서 온 어머니들로 구성된 다문화가정의 자녀들입니다. 이 땅에서 한국 아빠와 타국 엄마 사이에서 태어난 자녀들도 있지만, 친 엄마를 찾아 그들의 조국을 떠나 한국의 새 아빠와 다문화가정을 이룬 자녀들도 약 25,000여명이 있다고 합니다. 오늘날 한국 미디어에서는 이 청소년을 앞으로 사회적으로 많은 문제점이 발생 할 수도 있다고 발표합니다. 그러나 우리는 그들이 한국과 그들의 모국에서 에즈마이야로서 기여 할 수 있는 가능성을 믿고, 또 두 나라의 우호적인 관계와 하나님의 복음을 위한 도구로 쓰임 받는 자녀로 성장되는 꿈을 가지고 있습니다. 안은 미국에서 발행된 VBS 교재를 사용했는데, 한국의 실정에 안맞기도 하고, 또 내용도 너무 기본적인 이야기의 반복이므로, 보다 성경적이고, 한국 상황에 맞는 교재를 자체 제작하여 사용한지 이제 3년이 되었습니다. 이 교재가 한국의 농어촌 교회 뿐 만 아니라, 전 세계 180여개국의 약 6천개의 한인교회에도 잘고 , 더 나아가 영어권의 모든 나라들의 아이들에게 잘 맞는 교재가 되기를 기도하고 있습니다. 그리고 이 에즈마이야 사역이 점차 한국을 넘어서, 필리핀과 미얀마와, 그리고 영국과 심지어 중동의 요르단으로 까지 확장되고 있습니다. 한국의 MK들이 이 사역에 부르심을 받아 본인들이 자라난 선교지의 아이들에게 이 에즈마이야 사역을 시행하는 일이 지금 이루어지려고 합니다. 이 에즈마이야 사역을 하나님께서 다음 세대의 효과적인 선교사역으로 활용하시리라는 기대감이 있습니다. 이 에즈마이야 사역에 여러분을 초청합니다! 주님의 거룩한 부르심에 순종하는 한인 디아스포라 2세들을 기다립니다! Throughout most of the year, the Ezemiah leadership and production team creates the content of the VBS while also recruiting and praying for the applicants. 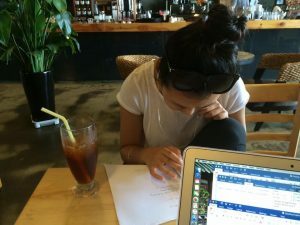 Because we are scattered throughout the US, Korea, and sometimes Australia and Europe during these months, sometimes our conference calls require some creative Kakaotalk and Skype maneuvering! In the spring and usually in May, we host a one-day seminar at All Love Church (our home base in Seoul) for the rural churches participating in Ezemiah that summer. Pastors and teachers take the bus and train from all over South Korea to learn about what the upcoming VBS content will be and how to best prepare for it (stage setup, materials for stations, costumes, music). This day is also a great opportunity for newer churches to learn from older churches (some have participated since 2007!) and for churches with less resources to partner with more resources. For example, passing on the already-constructed stage and leftover materials from a “Round One church” to the “Round Two church” has been a key way that churches have supported one another. The student leaders fly into Seoul the first week of June in order to fully absorb the VBS content and prepare simple English manuals with which to teach the Ezemiahs at the conference. It’s also some good times hanging out with friends that we haven’t seen in a few months to a year! youth in the Korean diaspora and pray for the nation, the health of the diaspora churches, and for North Korea. During the conference, we also meet the people who will become our team members on site. Each team member is assigned to a station and role in the opening and Bible Story skits (Crafts Station Leader, Games Station Leader, Snacks Stations Leader, Bible Story (Play) Roles, Etc), and the memorization, practice, and feedback begin! Though there is a lot of content to be learned and possibly courage needed for overcoming stage fright, we find that after the initial awkwardness people enjoy being silly and doing the sing-along or skits “for kids” – because – let’s face it – sometimes we are just adults who miss being a kid! 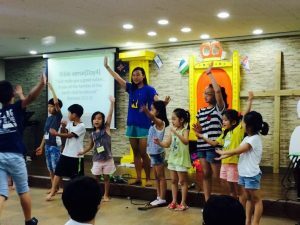 Each team does the whole VBS program in two different locations all over rural South Korea. (Oh yeah, the humidity, mosquitoes and possibly bucket showers!) Each team collaborates with a local church, which hosts the VBS for the kids in the area. This is a time where many of us experience God’s love and power. 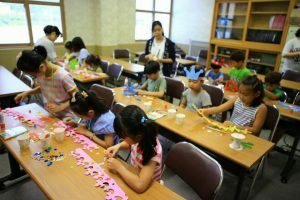 You will be mostly preparing and teaching the VBS throughout the day, but in the afternoons and evenings there are many opportunities to experience local Korean hospitality in terms of food, accomodation, fruit, possibly some sightseeing. Did we mention food? You will be very well-fed (or at least often-fed), thanks to Korea rural hospitality. All the teams gather at the place of debrief (in the past: Seoul and Jeonju) and take time to process the crazy past two-three weeks. We share amazing, funny, and maybe heartbreaking stories. We also take some space and time to reflect quietly. We also collectively gather feedback in order to improve the VBS content – which is edited, translated, and reused in Korea the next summer by hundreds of Korean churches through Life Place Bible Ministries! 일 년 내내 Ezemiah 리더들팀은 VBS의 내용을 작성하는 동시에 에즈마이야들을 모집합니다. 이 시기 동안 미국, 캐나다와 한국, 때로는 호주와 유럽등 세계 각국에 흩어져 있기 때문에 창의적인 카톡, 이메일, 스카이프, 페북의 활용이 나날 이루어 지고 있습니다! 봄 주로 5월에 그 해 여름에 에즈마이야에 참여하는 농어촌 지역 교회들을 위한 다애교회 (서울에 있는 본부)에서 하루간의 세미나를 개최합니다. 목사님들과 선생님들께서는 전국 먼곳에서 버스와 기차를 타고 오셔서 이번해의 여름 성경학교 VBS 내용은 무엇인지, 어떻게 준비 하는지 (무대, 의상, 음악, 만들기, 간식, 게임 자료) 설명을 들으시고 돌아가셔서 두달간의 준비를 시작하십니다. 또 이 강습회 새로 참여하는 교회들은 에즈마이야에 더 오래 참여한 베테랑 교회들에게서부터 배울수 있는 귀한 시간도 되고 더 큰 교회들이 더 작은 교회들과 협력해 자원을 나누어 가질 수 있는 좋은 기회이기도 합니다. 예를 들어, “제 1차 (Round One) 교회”에서 “제 2차 (Round Two) 교회”로 이미 구성된 무대 및 남은 재료를 전달하는 것은 지역 교회가 서로를 돕는 핵심 방법중 하나입니다. 저희 리더 팀은 6월 초에 귀국하여 에즈마이야 컨퍼런스 준비를 먼저 합니다. 대본대로 성경 스토리 연극도 연습하고 한국말로 준비되어 있는 자료를 번역도 합니다. 일년간 보지 못했던 동역자 친구들과 어울리는 좋은 시간이기도합니다! 한인 디아스포라 교회 2세들과 선교사님 자녀들 MK들은 7월 중순 귀국해 바로 VBS 내용 훈련으로 들어갑니다. 7 월에 열리는 이 Ezemiah Conference는 주로 서울과 멀지 않은 수련회 장소 (양평 또는 수원)에서 진행됩니다. 곧 아이들에게 가르칠 여름 성경학교 내용을 배우고 연습하면서도 각각 문화권이 다른 한인 디아스포라 (diaspora) 청년들이 함께 모여 조국과 디아스포라 교회 그리고 북한을 위해 기도를 하며 정체성과 사명을 재발견하는 시간입니다. 또 수련회 도중엑 우리는 현장에서 같이 일할 팀원들을 만나게됩니다. 각 팀원은 연극과 스테이션에서 각각 다른 역할 (만들기 스테이션 리더, 게임 스테이션 리더, 스낵 스테이션 리더 등)을 맡게 됩니다. 팀별로 암기, 연극 연습, 및 피드백이 시작됩니다! 배울 내용이 많고 또 때론 무대 공포증을 극복하기가 쉽진 않지만 팀원들은 대부분 초기의 어색함을 잊은 채 이틀째 즘 아이처럼 노래 부르고 율동하며 “어린이 모드”로 들어갑니다. 어린이에게 성경을 가르치려고 준비하는 저희 청년들이 결국 가장 많이 배우게 됩니다! 각 팀은 컨퍼런스가 끝나면 곧바로 맡아진 농어촌 교회 사역지로 흩어져 여름 성경 학교 VBS 프로그램을 나흘 동안 진행합니다. (습기, 모기, 세숫대야 샤워 등 버라이어티한 체험을 하게 됩니다!) 1차 사역지의 프로그램이 끝나면 하루 안에 이동하고 준비한 다음 2차 사역지에서 같은 프로그램을 나흘 동안 진행합니다. 힘든 9일간에 예정이지만 이 과정을 통해 많은 청년들이 하나님의 사랑과 능력에 의존하게 됩니다. 부모, 전도사님, 선생님 없이 본인들이 리더가 되어 프로그램을 진행하고 소위 한국 “어른”들과 대면하며 협력하는 과정을 통해 많은 젊은 디아스포라 2세 청년들이 귀한 경험을 하게 됩니다. 또 대부분 VBS를 이른 오전 내내 준비하고 가르치지만, 오후와 저녁에는 농어촌 특유의 체험과 음식을 경험하며 한국의 따뜻한 문화도 경험하게 됩니다. 모든 팀들은 (서울이나 다른 중심 도시) 1차, 2차 사역을 마친 후 한 곳에 모여서 2 ~ 3 주간의 일을 정리해 봅니다. 여러 이야기를 나누고 팀별로, 개인적으로도 하나님과의 조용한 시간도 가집니다. 또한 저희가 처음 개발, 사용해 보는 VBS프로그램 이기 보다 좋은 어린이 교재를 만들기 위해 콘텐츠를 어떻게 편집할지 의견을 모아 정리해 프로그램을 재검토 합니다. 이 과정을 거친 후 이 여름 성경 학교 프로그램은 생터 사역원에서 운영하는 키즈 프로그램에 사용 되기도 합니다. Have questions? Contact us at info@ezemiah.com or fill out the form on the contact page.